Work Glove. 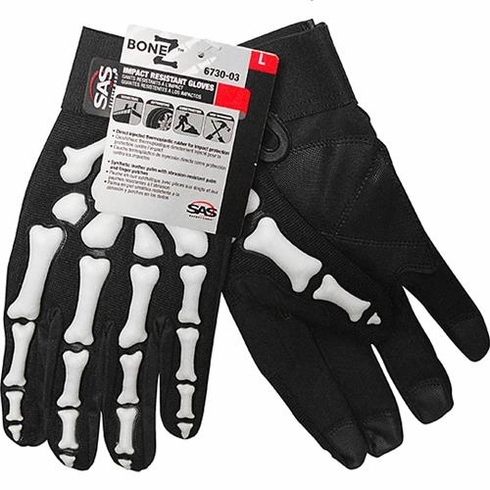 Impact Resistant Bonez Glove. By SAS Safety Provides hand protection from On-The Job injuries. Have a little fun while you work! Raised Thermoplastic Rubber (TPR) skeleton bones on knuckles, fingers and back of hand for mild impact protection. Synthetic leather palm patch and fingertips provides superior grip. Flexible spandex stretch knit fabric on back of hand provides comfort. Elasticized wrist with hook-and-loop closure for secured fit. Reinforced synthetic leather thumb crotch allows for a tough grip when handling tools.